I only completed one book in June, and it wasn’t even a particularly good one. Having house guests for most of the month really slows down one’s reading — though I hear the opposite is also possible. I really enjoyed The Martian (review), so asked the Internet what else I might like. 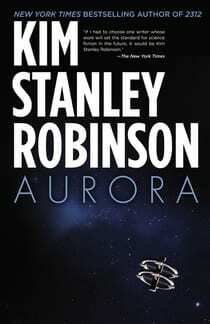 The answer was Aurora by Kim Stanley Robinson. I can see the logic, but it was faulty. Both books are SCIENCE fiction. I wrote before about how some science fiction books are more science and some are more fiction. The Martian was a fictional story about survival after being left-behind on Mars. Like MacGyver, astronaut Mark Watney combines his scientific knowledge with just about everything he has available to him to survive. The fictional story is a backdrop to a ton of science. “Aurora” refers to the ship’s destination. It is so far from Earth that communications are completely impossible. Supposedly Aurora offers an accurate portrayal of what multi-generational space travel would be like. In that sense, it’s an interesting tale. The problem was the vast majority of this book is narrated in third-person objective. Even though it was a story of fiction, it felt like a textbook. I never really cared about any of the characters or their outcome. Oh, I should probably also mention that it’s really long. Multi-generational long. That said, the story hits upon some very interesting topics. For example, the characters never volunteered for this mission or space travel. That decision was made several generations ago. I guess that’s always true – decisions my ancestors made are why I live in the US for example. But to condemn one’s descendants to a life away from earth, on a ship for their entire life, or to live and know only a foreign planet feels different. It’s inevitable though. Elon Musk is planning on colonizing Mars. There’s also elements of Wool (review) and Seveneves (review) in this book. Such a long journey requires extreme conservation. Everything, including water, food, and human bodies are part of a closed loop system. Nothing can be wasted. There’s nothing really wrong with Aurora. I found it dull, but it’s a popular and well regarded book. It raises some very important issues, and many of the obstacles encountered were both surprising, yet likely unavoidable.